This article is about the consumer operating system released in 1992. For the version of Windows NT released in 1993, see Windows NT 3.1. "Windows Janus" redirects here. For other uses, see List of Microsoft codenames. Windows 3.1, released on April 6, 1992, introduced a TrueType font system (and a set of highly legible fonts), which effectively made Windows a viable desktop publishing platform for the first time. Similar functionality was available for Windows 3.0 through Adobe Type Manager (ATM) font system from Adobe. Windows 3.1 was designed to have backward compatibility with older Windows platforms. As with Windows 3.0, version 3.1 had File Manager and Program Manager, but unlike all previous versions, Windows 3.1 cannot run in real mode. It included Minesweeper as a replacement for Reversi (though Reversi was still included in some copies). Windows 3.1 dropped real mode support and required a minimum of a 286 PC with 1 MB of RAM to run. The effect of this was to increase system stability over the crash-prone Windows 3.0. Some older features were removed, like CGA graphics support (although Windows 3.0's CGA driver still worked on 3.1) and compatibility with real-mode Windows 2.x applications. Truetype font support was added, providing scalable fonts to Windows applications, without having to resort to using a third-party font technology such as Adobe Type Manager. Windows 3.1 included the following fonts: Arial, Courier New, and Times New Roman, in regular, bold, italic, and bold-italic versions, as well as Symbol (a collection of scalable symbols). Truetype fonts could be scaled to any size and rotated, depending on the calling application. In 386 Enhanced Mode, windowed DOS applications gained the ability for users to manipulate menus and other objects in the program using the Windows mouse pointer, provided that a DOS application supported mice. A few DOS applications, such as late releases of Microsoft Word, could access Windows Clipboard. Windows' own drivers couldn't work directly with DOS applications; hardware such as mice required a DOS driver to be loaded before starting Windows. Icons could be dragged and dropped for the first time, in addition to having a more detailed appearance. A file could be dragged onto the Print Manager icon and the file would be printed by the current printer, assuming it was associated with an application capable of printing, such as a word processor. Alternatively, the file could be dragged out of File Manager and dropped onto an application icon or window for processing. While Windows 3.0 was limited to 16 MB maximum memory, Windows 3.1 can access a theoretical 4 GB in 386 Enhanced Mode. The actual practical ceiling is 256 MB. However, no single process can use more than 16 MB. File Manager was significantly improved over Windows 3.0. Multimedia support was enhanced over what was available in Windows 3.0 with Multimedia Extensions and available to all Windows 3.1 users. Windows 3.1 was available via 720 KB, 1.2 MB, and 1.44 MB floppy distributions. It was also the first version of Windows to be distributed on CD-ROM — although this was more common for Windows for Workgroups 3.11, which typically came with MS-DOS 6.22 on one CD. Installed size on the hard disk was between 10 MB and 15 MB. Windows 3.1's calendar uses the .cal filename extension. Windows 3.1 also introduced the Windows Registry, a centralized database that can store configuration information and settings for various operating systems components and applications. 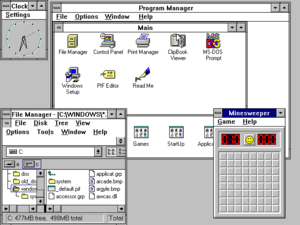 Windows 3.1 was the first version that could also launch Windows programs via Command.com. A special version named Windows 3.1 for Central and Eastern Europe was released that allowed use of Cyrillic and had fonts with diacritical marks characteristic of Central and Eastern European languages. Microsoft introduced its own code page (Windows-1250) and supported its use in violation of many countries' ISO standards (e.g., the official Polish codepage is ISO-8859-2, which was ignored by Microsoft but is supported by contemporary Internet Explorer versions). Similarly, Microsoft also released Windows 3.1J with support for Japanese, which shipped 1.46 million copies in its first year on the market (1993) in Japan. Modular Windows is a special version of Windows 3.1, designed to run on Tandy Video Information System. Windows 3.11 was released on November 8, 1993. It did not add many feature improvements over Windows 3.1; it primarily contained bug fixes, but was considered a significant improvement because of those fixes, contributing to the operating system's popularity. Microsoft replaced all retail versions of Windows 3.1 with Windows 3.11 and provided a free upgrade to anyone who currently owned Windows 3.1. On November 22, 1993, Microsoft released a Simplified Chinese version of Windows for the Chinese market. A year later, an update was released, which identified itself as Windows 3.2. Thus, Windows 3.2 is an updated version of the Chinese version of Windows 3.1. The update was limited to this language version, as it only fixed issues related to the complex input system for the Chinese language. Windows for Workgroups is an extension that allowed users to share their resources and to request those of others without a centralized authentication server. It used SMB protocol over NetBIOS. Windows for Workgroups 3.1 (originally codenamed Winball and later Sparta), released in October 1992, is an extended version of Windows 3.1 that features native networking support. It comes with SMB file sharing support via NetBIOS-based NBF and/or IPX network transport protocols and introduces the Hearts card game and VSHARE.386, a VxD version of SHARE.EXE (a terminate-and-stay-resident program). A Winsock package was required to support TCP/IP networking in Windows 3.x. Usually third-party packages were used, but in August 1994, Microsoft released an add-on package (codenamed Wolverine) that provided TCP/IP support in Windows for Workgroups 3.11. Wolverine was a 32-bit stack (accessible from 16-bit Windows applications via WinSock Thunk), which gave it superior performance to most of the third-party TCP/IP Windows stacks available. However, it was only compatible with Windows for Workgroups 3.11, and lacked support for dial-up. Wolverine stack was an early version of the TCP/IP stack that would later ship with Windows 95, and provided an early testbed for the 16-to-32-bit compatibility layer that was crucial to Windows 95's success. Following the release of MS-DOS 6.22 in 1994, WFW 3.11 largely replaced Windows 3.1 for OEM installations on new PCs due to its improved capabilities and greater stability. Video for Windows was first introduced in November 1992 as a reaction to Apple Computer's QuickTime technology which added digital video to Macintosh. Costing around $200, the software included editing and encoding programs for use with video input boards. A runtime version for viewing videos only was also made available. Originally released as a free add-on to Windows 3.1 and Windows 3.11, it then became an integral component of Windows 95 and later. Like QuickTime there were three components in Video for Windows. The technology introduced a file format designed to store digital video, Audio Video Interleave (AVI). The technology provided an application programming interface that allowed Windows software developers to add the ability to play or manipulate digital video to their own applications. Lastly, it included a suite of software for playing and manipulating digital video. Windows for Pen Computing was a series of Microsoft-produced add-ons for Microsoft Windows versions in the mid-1990s with additional tools for tablet PCs. Windows for Pen Computing (also known as Pen Windows and W4PC) was developed as Microsoft's pen computing response to PenPoint OS by GO Corporation. Windows for Pen Computing was rendered obsolete by Tablet PC support for Windows XP Tablet PC Edition in 2002. Windows 3.1x was given limited compatibility with the then-new 32-bit Windows API used by Windows NT by another add-on package, Win32s. There was a rumor that Microsoft did not want to increase any mainstream Windows 3.1x version to something like "Windows 3.2" because it could be confused with the Win32 API or otherwise distract consumers from upgrading to a "real 32-bit OS", though Windows NT 3.1 and 3.5 were both 32-bit operating systems that looked similar in appearance. A game called FreeCell was included for testing the new Win32s functions. To entice game manufacturers to move from DOS to Windows, Microsoft provided a first attempt at high-speed graphics and animation capabilities for Windows 3.1x, introduced in September 1994. Windows' GDI capabilities were originally designed with static images in mind, allowing only for write-only graphics calls. WinG provided a device-independent interface to graphics and printer hardware, and allowed programs to have both read and write capabilities to the WinGDC (WinG device context). Internet Explorer 2 through Internet Explorer 5 were released for Windows 3.1. Microsoft began a television advertising campaign for the first time on March 1, 1992. The advertisements, developed by Ogilvy & Mather, were designed to introduce a broader audience to Windows. Windows 3.1 was shipped worldwide on April 6, 1992, and reached three million sales two months later. The year of Windows 3.1's release was successful for Microsoft, which was named the "Most Innovative Company Operating in the U.S." by Fortune magazine, while Windows became the most widely used GUI-based operating environment. Windows 3.x was superseded by the release of Windows 95 in August 1995. Microsoft officially dropped support for all 16-bit versions of Windows on November 1, 2008. On July 14, 2013, Linux kernel version 3.11 was officially named "Linux For Workgroups" as a tongue-in-cheek reference to "Windows for Workgroups 3.11". ^ "Windows Version History". Support. Microsoft. July 14, 2005. ^ Edson, Kate (March 1993). "Windows 3.1 and TrueType Fonts". PC Update, the magazine of Melbourne PC User Group, Australia. Archived from the original on May 11, 2002. Retrieved 24 October 2014. ^ "Windows 3.1 Memory Limits". Support. Microsoft. Archived from the original on May 18, 2015. ^ Virginia Kouyoumdjian (August 1994). "DOS/V, Windows, Prices, and the Future..." Computing Japan. Retrieved September 4, 2009. ^ "Windows 3.11". WinWorld. Syngress MCSA/MCSE Managing and Maintaining a Windows Server 2003 Environment, Page 6. Retrieved 11 March 2015. ^ a b "Microsoft Windows Simplified Chinese 3.2 Upgrade Is Available". microsoft.com. Microsoft. October 30, 2003. Archived from the original on November 8, 2006. ^ "Windows for Workgroups Version History". Support. Microsoft. November 14, 2003. Archived from the original on November 7, 2006. Retrieved September 23, 2010. ^ "Windows 3.1". GUIdebook. Retrieved September 4, 2009. ^ "Windows history". PC Museum. June 17, 2002. Archived from the original on March 16, 2002. Retrieved September 4, 2009. ^ PC Plus. Future Publishing. May 1993. p. 61. ^ Hecker, Chris (1 June 1997). "A Whirlwind Tour of WinG". Gamasutra. Gamasutra. Archived from the original on 27 February 2008. Retrieved 17 November 2014. ^ "Old Version of Internet Explorer for Windows 3.1". OldApps.com. Retrieved 17 September 2014. ^ Gill Dunsford (February 23, 2007). "Feature: Brand Microsoft". Sales Promotion. Archived from the original on March 8, 2007. Retrieved September 4, 2009. ^ Dan Goodin (April 28, 1999). "Microsoft emails focus on DR-DOS threat". CNET News. Retrieved September 4, 2009. ^ Graham Lea (January 13, 2000). "Caldera vs Microsoft – the settlement". BBC News. Retrieved September 4, 2009. ^ Mark Ward (November 5, 2008). "The end of an era – Windows 3.x". BBC News. Retrieved September 4, 2009. ^ John Coyne (July 9, 2008). "It's the End for 3.11!!". Microsoft. Retrieved September 4, 2009. "Windows Version History". Support. Microsoft. "Windows for Workgroups Version History". Support. Microsoft. "Windows 3.1 Hardware Compatibility List". Support. Microsoft.